Woshock- A Smartphone based Shock-Gun for women security. In India, one person dies every 4 minutes in a road accident, according to a report released by SaveLIFE foundation in Oct 2015. It was also revealed that half of all the deaths on the country's roads are among vulnerable road users-motorcyclists, pedestrians, and cyclists. According to the data released by the National Crime Records Bureau, crimes against women have more than doubled over the past ten years, The cases of violent abuse of women have steadily increased since 2009. The ever increasing traffic and decreasing in women safety is at an alarming rate and the major concern is what can be done to tackle it. And if we look at the amount of waste generated, India generates about 60 million tonnes of trash every year. We don’t have any concrete way to disposal of waste generated. The health of the citizens of India is at a risk too. With the wave of urbanisation, and India being at a point of significant transition, let’s think about how technology can help to solve these issues. We are conducting a hackathon aimed to provide technology solutions for social impact. With this hackathon, build applications for improving transportation, crime prevention and public safety, cleaner and healthier city. 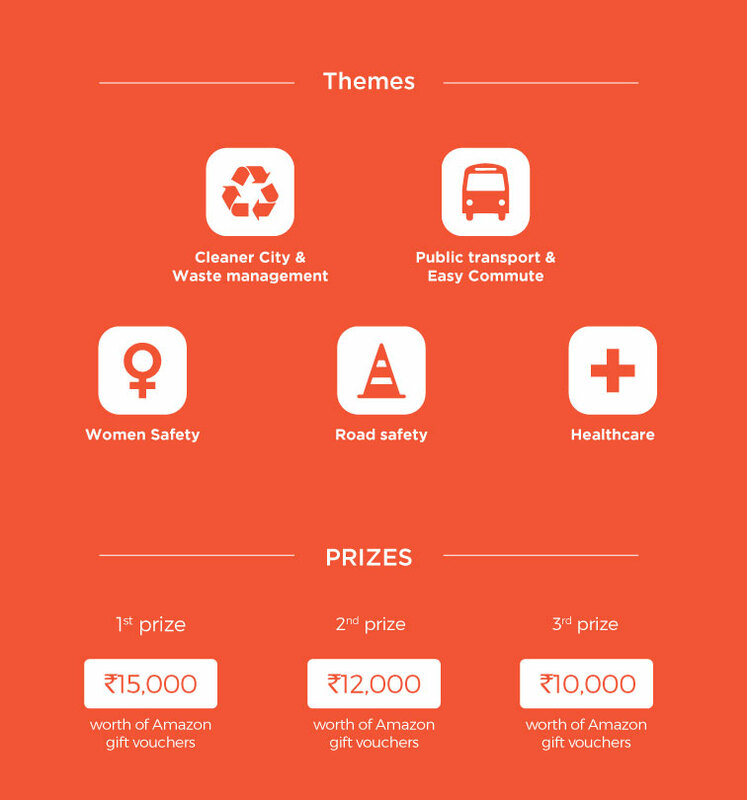 We are putting out a call to all coders, to come and join us in a quest to build solutions for the social causes and making India a cleaner and safer place to live in. Second phase : Offline hackathon - Hack on your idea and build the app in a 24-hour hackathon in the offline phase which will take place on 30th July 2016 at HackerEarth office. In India, road accidents account for over 100,000 deaths annually, and over 500,000 serious injuries. This data is from 2013. As per 2014 data, the number increased by 15%, and the trend for 2015 isn’t reducing. There are many factors that are behind road accidents, and data and technology can play a vital role in reducing them. Be it at the driver’s end, where technologies like assistive breaking on cars, or smart cameras on signals or even software for better surveillance; all of these can help in improving road safety. What can you build? Public transport is going to be the backbone for any densely populated area. Buses are still going to be able to transport more people from one place to another while occupying a significantly lesser area per person than any other mode of transport. Metro rails more so.Whether we like to admit it or not, India has a traffic problem. And cities are also vastly changing. And add India’s dense population, and what you have is a commuting nightmare. However, Indians are already leveraging technology to get by traffic. How can technology make sure that all citizens are aware of the offering of the public transport and how technology can help in better commute? Crime against women is at a nauseating high across the world. Be it on the streets, public transport or even the internet, violence against women is on the rise. However, cyber awareness apps and early warning systems have helped in curbing this problem. However, it is time for technology to step up. How can you employ technology in our day to day lives, to make sure that violence against women doesn’t happen again or at least the offender doesn’t go unpunished? Think about how to help the socially conscious citizens of India use mobile tech and reach of mobile phone to contribute to it a better place to live in. Or how about using mobile tech to help in Garbage Segregation?Enable the citizens to keep a check on escalations in own area and help improve it on fast track.Build applications that aid the authorities to take actions based on the overall big picture emerging from the citizen inputs.